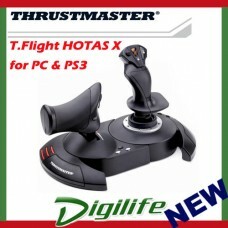 * Manufacturers name: T.Flight Hotas X. * 12 buttons and 5 axes, all extensively programmable. * Rotating handle with locking system or progressive tilt lever for rudder. Please email us if the item is DOA (dead on arrival) within 7 days from the date of dispatch.We will replace the item if the returned item has been found faulty after the checking by our technician. However,you will be charged inspection fee of $15.00 if the returned item is found to be working and the item will be delivered back to you at your expense.